Being Human is one of my favorite shows, and I just love it. It is a British show about a vampire, a werewolf, and a ghost, who all share an apartment. It sounds like a bad joke, but it's actually a very good show that is more or less very serious. These are just people trying to live a normal life, even though they are different. There are many issues addressed, such as prejudice. There are other characters, of course, that are also the same kind of creatures, and they are not all nice people. This is the second season, and nothing is dull or predictable about it. It carries on very naturally but surprisingly from the first season. That's why I love it - it is always shocking and makes me want to see what will happen next with these very-likable "monsters". You will not be disappointed! The DVD set comes with a lot of special features. One is all about the blood they use on the show. Another is about the cool underground caves they used in Bristol. Another is about George being a werewolf and the makeup behind it. Another is about how they showed the sixties flashbacks, how they did the sets, the costumes, hair, etc. The actors and crew comment throughout each feature. Another special is about the train scene, and there are also easter eggs and special commentary. It's quite a lot for any set! If you love horror, or just very good TV, you will love this show, and this DVD. It is the best of all the vampire shows out there (as much as I love Supernatural, True Blood, and Vampire Diaries). You can win the DVD on our Monthly DVD Giveaway! Check out our Being Human Page, too! This month, the BBC will be releasing this great show on DVD and Blu-ray. 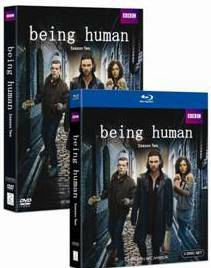 Being Human returns for a gripping second season as vampire Mitchell (Aidan Turner), werewolf George (Russell Tovey), and ghost Annie (Lenora Crichlow) encounter new enemies in their fight to lead something close to normal lives. It's tough being supernatural. Mitchell's romance with a feisty doctor is disrupted by a vampire community in disarray. George's relationship with a new girlfriend is undermined by an uncontrollable twist in his werewolf existence. Annie has a brutal reminder that life as a spirit is full of challenges. All three are threatened by CenSSA, a religious organization committed to the destruction or conversion of supernatural freaks, operated by the mysterious Professor Jaggat and the sinister, cold-hearted Kemp. Just when your inner demons might be conquered, it's the outer demons who won't go away.